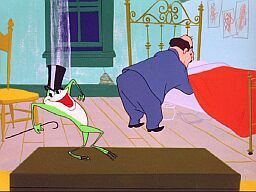 Michigan J. Frog shifts into a more upbeat tune as he tries out I'm Just Wild About Harry. 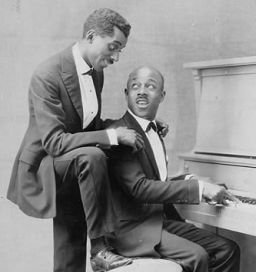 Noble Sissle and Eubie Blake were two pioneering African-American songwriters who began their careers in the early 1900s. The two met as part of a group called Joe Porter's Serenaders in 1915. Together they wrote their first song, It's All Your Fault. After splitting apart for awhile they were encouraged to try entering the "white" vaudeville circuit. There weren't many black teams there because only one "black" act was allowed per show. 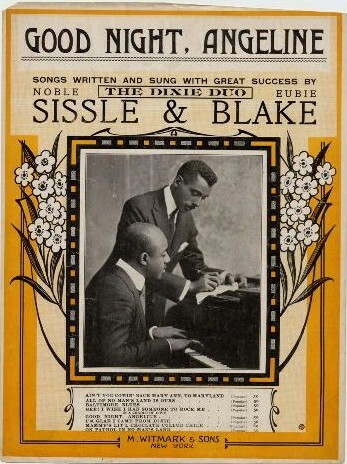 Sissle and Blake went ahead with the idea, calling themselves The Dixie Duo. Their act used a piano as the only prop and was preformed without blackface and became very successful. In 1921 this writing team decided to organize one of the first musicals to be written, produced, and directed by blacks. 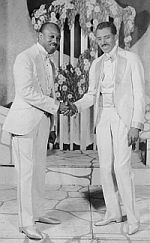 They called it Shuffle Along and launched it on May 23, 1921. It became extremely successful and served as a launching pad for a number of black performers. The most popular tune to emerge from it was the I'm Just Wild About Harry. One final tidbit: this song was written long before Harry Truman ran for President, but it was rewritten and then used during his campaign. Eubie Blake said that he strongly supported Truman because he integrated the armed forces. If you want to learn even more about this song and the people behind it, here are few webpages you might want to check out. Photos and article about "Shuffle Along"
Eubie Blake performing "Bandana Days and I'm Just Wild About Harry"